With a carefully crafted ceremony that combined state-of-the-art technology, stirring messages, and top-notch musical performances, Seventh-day Adventist leaders in the Northern Asia-Pacific Division (NSD) declared the 2018 International Mission Congress officially open in Goyang, Republic of Korea, on August 8, 2018. 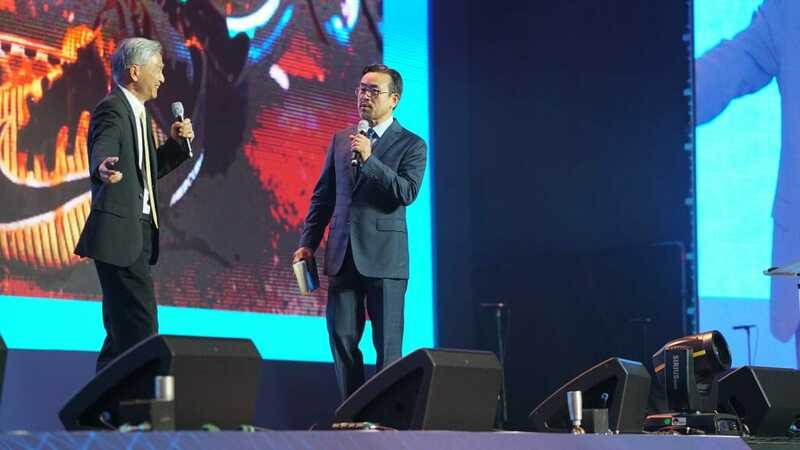 The region-wide event has drawn about 4,000 mission-minded church members of all ages to the massive Korea International Exhibition and Convention Center (KINTEX) for four days of training, outreach, and witnessing. Most of the people attending live and serve in one of the NSD countries and territories, which includes North and South Korea, China, Hong Kong, Japan, Macao, Mongolia, and Taiwan. Some representatives came from other church fields, as well as from the world church headquarters in Silver Spring, Maryland, United States. The 120-minute opening ceremony began with a choreographed review of the mission beginnings across the region. The display, which included oratorio-style recitatives, traditional instrumental music, and special effects, told the story of Seventh-day Adventist pioneers in that part of Asia. Precisely 130 years ago, in 1888, the first self-supporting missionary, Abram La Rue, arrived in China. He is credited with being the first to bring the Advent message to that nation. Some of the people La Rue trained would later go as missionaries to other Asian nations, including Japan and Korea. A parade through the hall to the main stage featured representatives from the various fields, including world church and NSD leaders. Marching leaders and representatives wore traditional outfits, including several different costumes from within the same region. Taiwan Conference (TWC) president Noah Lai explained, “Our outfits are different because we have different tribes, different cultures. We have many challenges to share the gospel.” The TWC territory was officially organized five years ago after being part of a larger church region. The 101-member Mongolia Mission delegation provided one of the highlights of the introductory parade. The Mission’s president, Yo Han Kim, shared that exactly 25 years ago, the first Seventh-day Adventist convert was baptized in Mongolia by the then world church president Robert Folkenberg Sr.
To the surprise of the audience, Kim announced, “The first two Adventists and missionaries to the land of Mongolia are here with us tonight.” A second later, two women stepped forward. They were greeted with strong applause. Ng closed the opening-night ceremony with an impassioned call for missionaries to go out and find those in need of knowing Jesus. Reflecting on Jesus’ parables of the lost sheep, the lost coin, and the lost son (Luke 15), Ng said God is always trying to woo people back to Himself and that we should do the same. The International Mission Congress continues until August 11.